I’ve had to divide it into 4 stages to make it a bit easier to deal with. 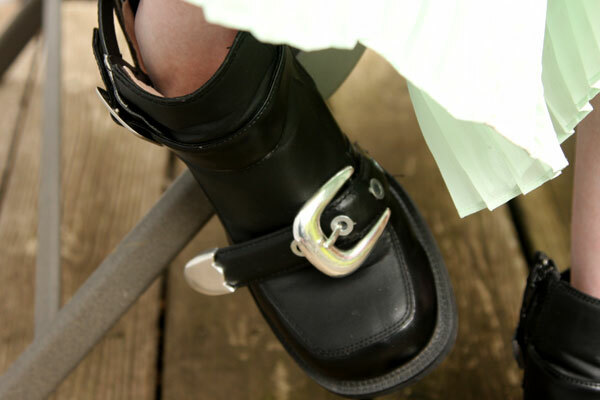 The end result is fairly dependent on the boots you started with, and what the hardware you add looks like. Of course you can just cut the outer part of the shoe and leave it at that. But I always find that cutting something leather or vinyl leaves and obvious, unfinished edge that screams home-made!. I like to create a faux finished edge as best I can. 1.Mark the shoes for the cut-out part similar to the originals with the chalk, using your photo as reference. 2. 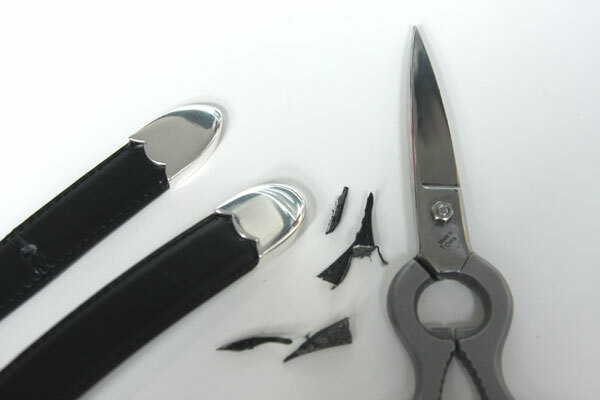 Cut away the outer layer of the shoe, and cut them down to ankle-length if they have longer shafts. 3. 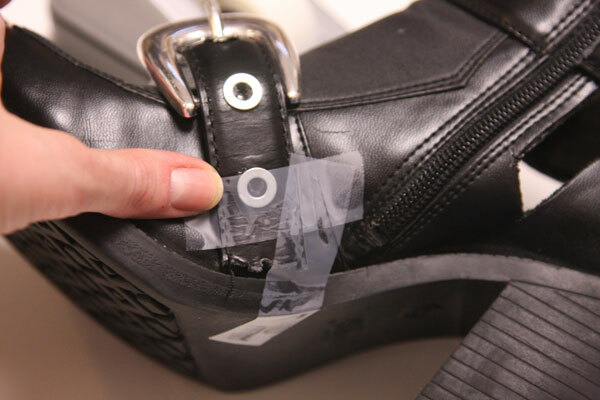 Cut away the inner layers of the shoe so they aren’t visible from the outside. You may have to go through several layers, some of them sticky, to trim them properly. The materials you need for this stage depend on what is attached to the boots you have. 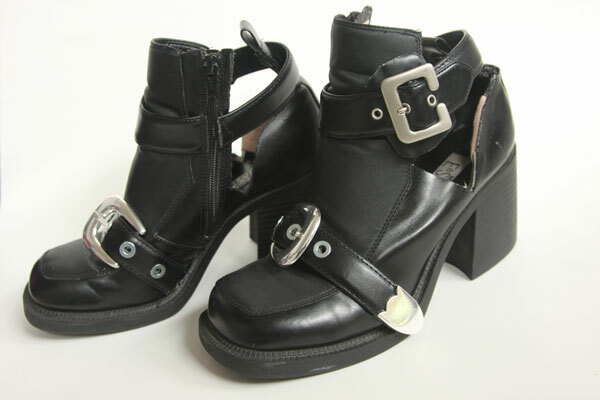 I was lucky enough to find boots that had belts attached to them, which I cannibalized and used, but if you don’t have the straps already, you’ll have to make them from belts. 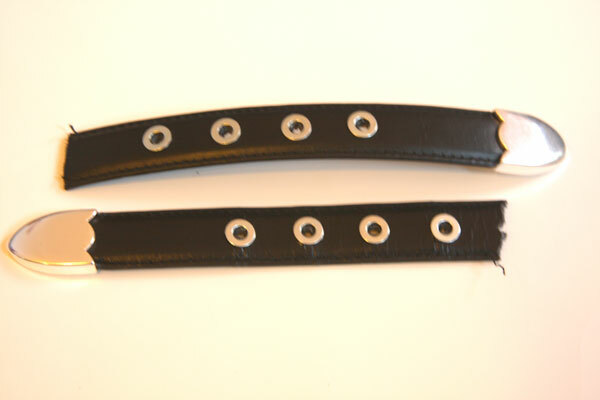 Depending on how long your belts are, you may need two, and you’ll want to get belts that are exactly the same. 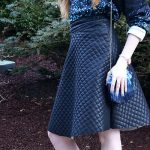 If you can find belts that have small-size buckles, so much the better! 1. 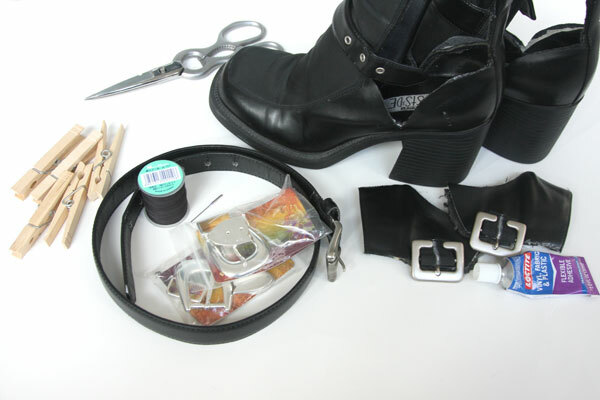 Create the belts: first cut 4 lengths (2 to go around the outside of the shoe at the ankle (starting at the finished end of each belt); 2 for the toe box area (this time not using a finished end of the belt). 3. 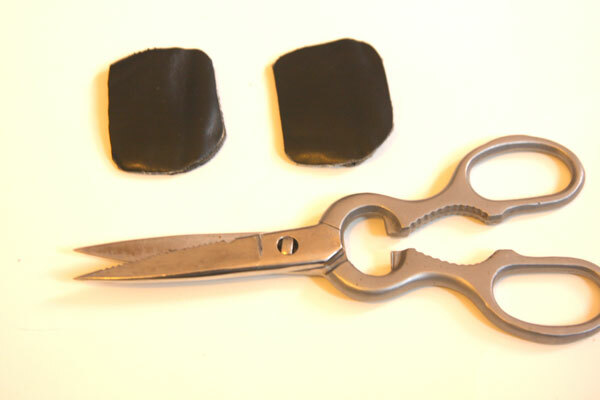 Cut 2 small pieces of vinyl or leather (I used the parts I cut out of the boots), slightly larger than your buckles. 4. 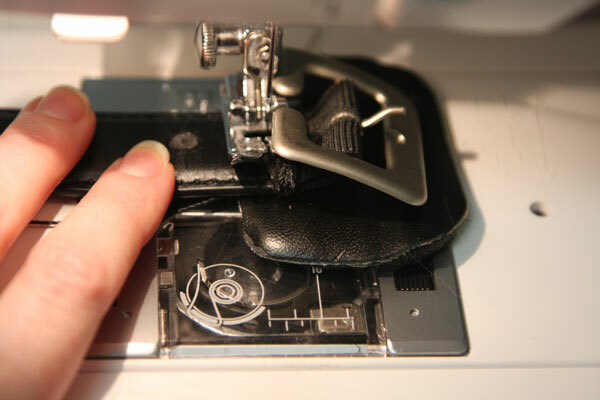 Using a leather needle and upholstery thread, stitch the pieces under the buckles. 5. Next, make the belts for the toe box area. 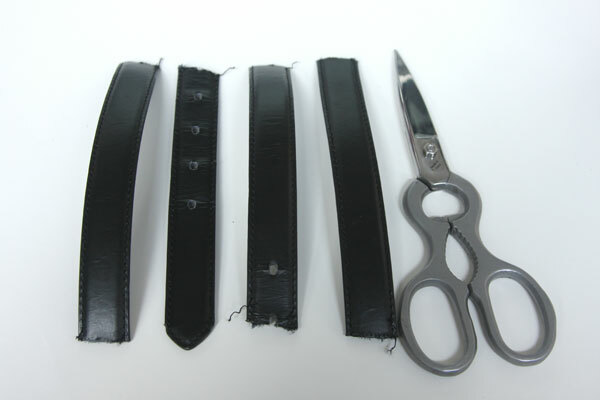 Choose one end of each belt and cut away the excess to taper it. Place the belt tips over the ends to make sure they will fit. 6. 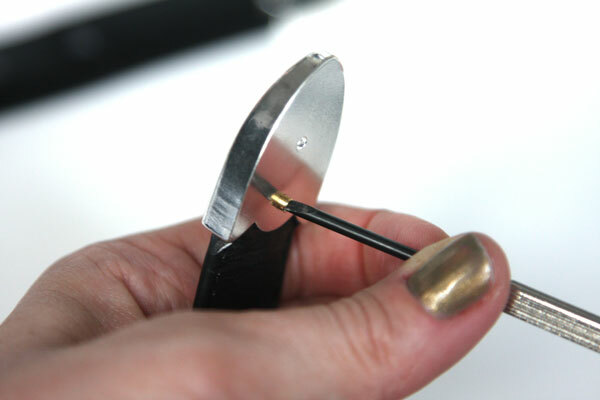 Attach the silver belt tip to each tapered end with the screwdriver and included screw. 7. 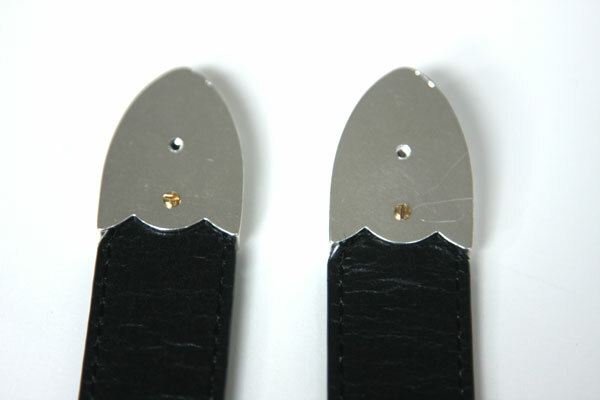 Mark where you want the holes for the matching belt length (these are for the toe boxes). I just made a dent with my screwdriver. 8. 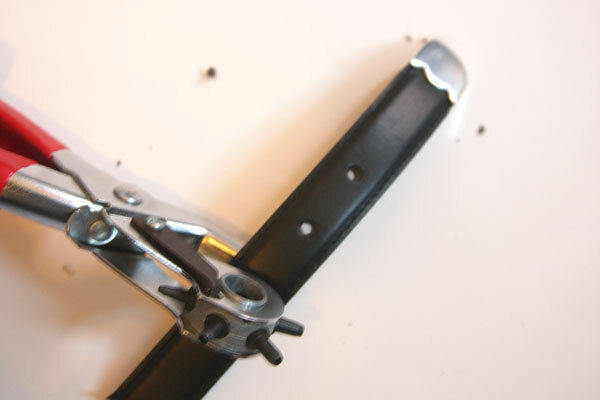 Punch holes for the buckles with an awl or leather punch tool. 9. 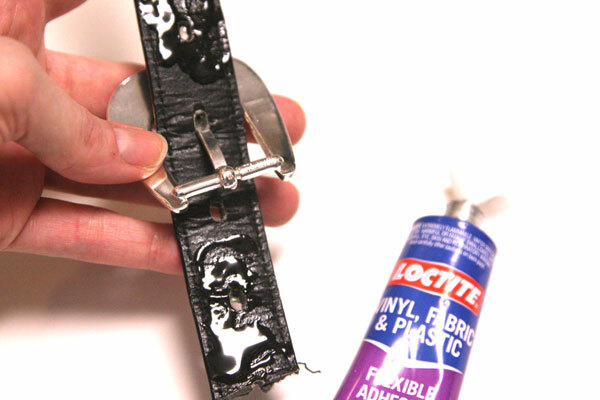 Attach a silver washer around each hole using the Loctite Adhesive, and a toothpick for precision. Allow to dry 24+ hours. 10. 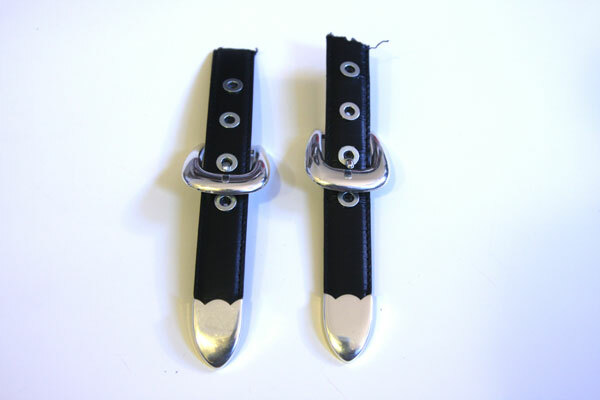 Once dry, thread the buckles onto these two belts, through the washer-ringed hole. I chose not to spray my belt buckles black, but that’s certainly an option for you if you really, really want to dupe the originals. This is by far the hardest part (I found) because of the stitching. 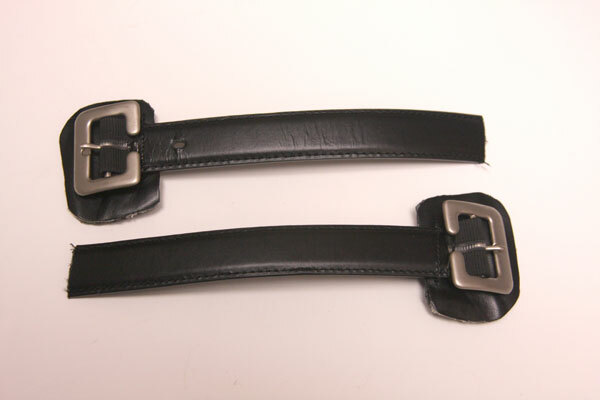 For the belts/straps that go around the ankles, they must be securely attached since they need to withstand the strain of repeated stretching and movement. Though you can glue them, I really recommend that you run a line of stitches through the end to completely secure them to the boots. 1. 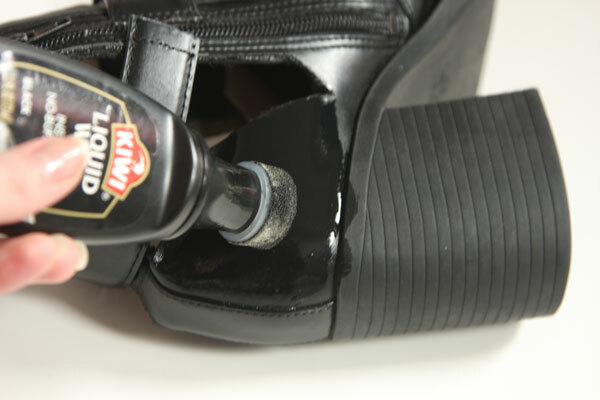 For the ankle belts, spread glue on one end and secure to the inner side of the boot at the ankle area. 4. 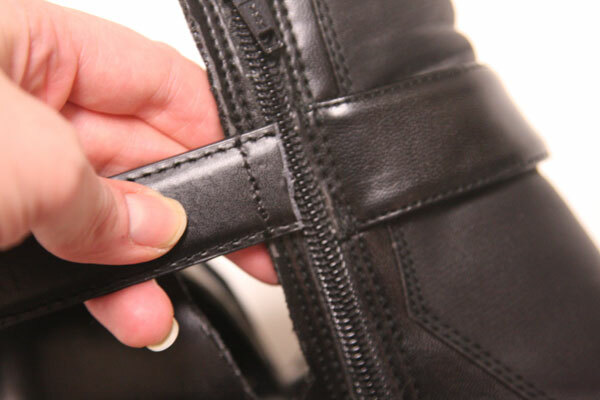 For the belts on the toe boxes, spread adhesive down the underside of each toe box belt, and secure to the top of each boot toe box. Tape down the ends to secure and let dry 24+ hours. 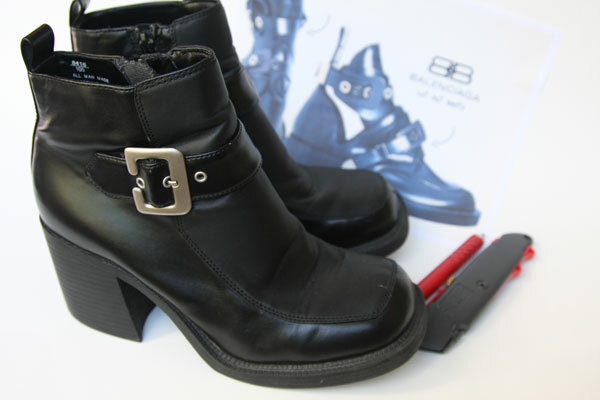 Last but not least, you need to make these boots wearable. Because you cut them up, the insides will probably be rough to bare feet and ankles – so moleskin is necessary. 1. 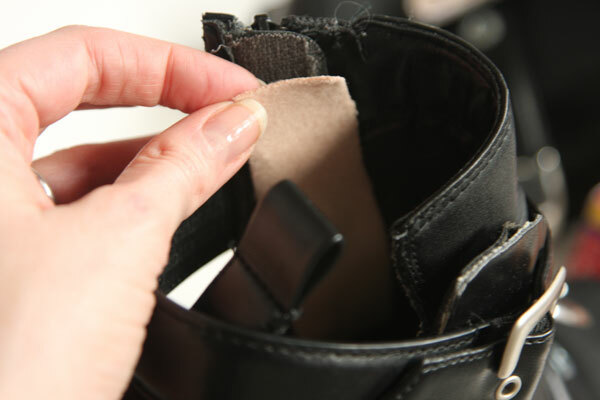 Cut small pieces of moleskin to cover up any rough spots on the insides of your boots. You may have to try them on repeatedly to identify any irritating areas. 2. 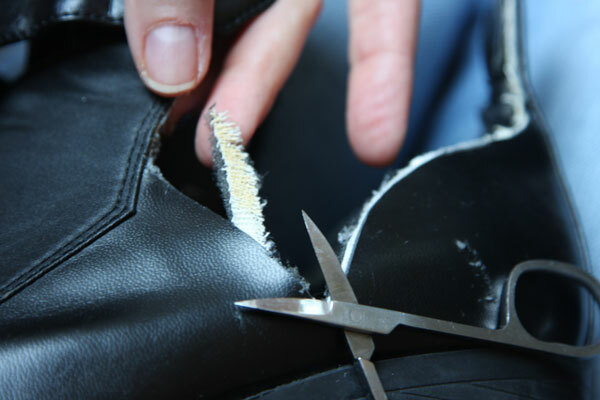 Polish them up with some black shoe polish, which will also hide any scuffs or mistakes with cutting. You’re finally done!! Celebrate with taking them out for a spin on the town! Notes: After wearing these a bit, I feel that the toe box belts also need to be sewn to the toe boxes to stay on; the ends begin to flap about. 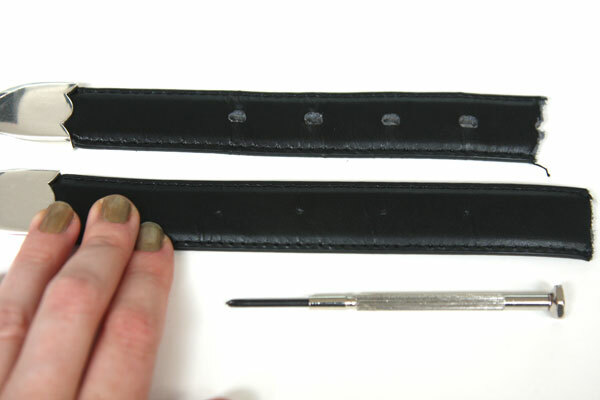 It can be done using a hand-sewing awl and piercing the leather from the outside, and tying the thread on the inside. 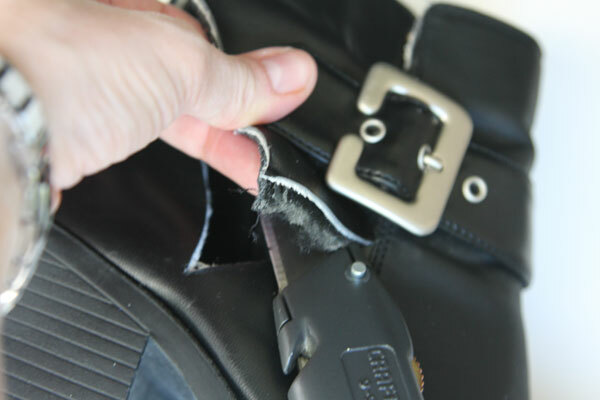 I also feel that the belts at the ankles need another security point – I think they either need to be threaded through two parallel slits cut into the back of the boots, or securing with a piece of elastic or some upholstery thread. I think that’s probably the only way these will withstand heavy use and lots of walking. I may in fact re-vamp the toe area to more closely match the original inspiration (i.e., place the belts there differently and add some extra vinyl flaps). 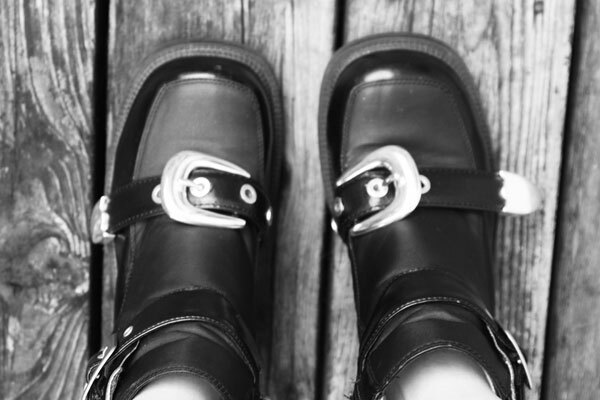 As for the studded soles of the Balenciagas, though I wracked my brain for a DIY solution, I couldn’t come up with one that wouldn’t be a safety hazard when walking. If anyone thinks of something, please let us all know! 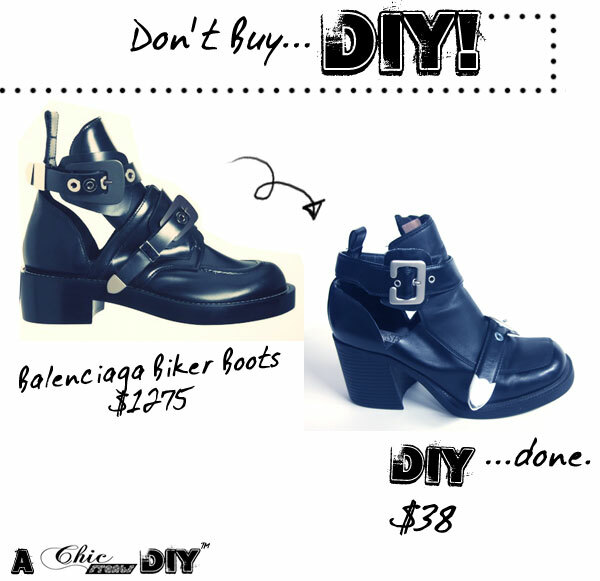 Hoped that helps and Happy DIY’ing! Great work. I love that you wore this with the long flowing skirt. I am so impressed! Amazing! I dream about this boots! Thanks for the tutorial!! these are a piece of art!!!!!!! oh my. oh my. i was waiting for this tutorial and result!!! beautiful. You did an incredible job!! That is an intense DIY! Your boots look waaaaay better! Awesome DIY. Can you tell me where I can buy shoes like this? Tutorial doesn’t seem too complicated, but finding appropriate shoes is! Well, I had to scour my local Goodwill for a couple weeks to find the perfect circa 90’s pair of clunky-heel boots…you can also probably find them on Etsy and Ebay. 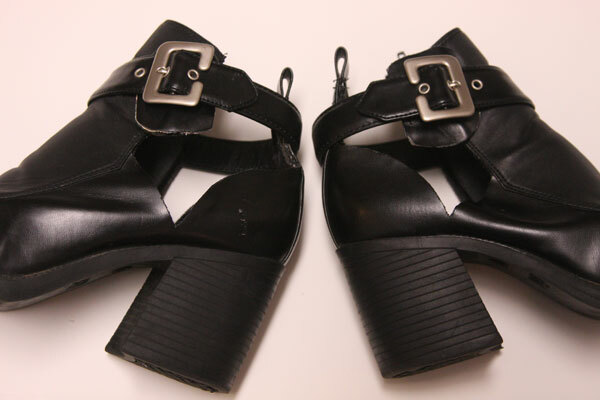 If you want to buy more contemporary ones, usually I’ve found there are only a few brands still making this style of chunky heel (like Jeffrey Campbell and Demonia), and they tend to be pretty pricey, so I think thrifted is the way to go here. It just takes some looking! They are incredible! Most impressive DIY I have seen for a long time.. You are so talented! What an inspiration!